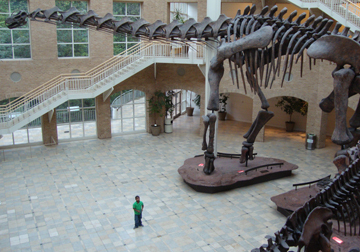 The Fernbank Museum of Natural History is more than dinosaur bones (which the kids love with all the enthusiasm their little hearts can muster) and fossilized leaves. In Atlanta, it's a landmark destination for learning, as well as a one-of-a-kind venue for events and special occasions. Upon arrival you know you're in for a quite an experience when you meander by the water garden featuring three bronze dinosaurs on your way into the Museum. 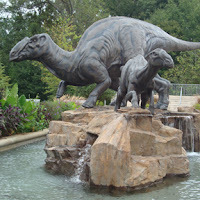 Fernbank is an excellent destination rain or shine, but be mindful of the weather when you visit so that you know whether to make your photos of this little dinosaur family before or after your Museum visit. I visited on a rainy day, but took a few pictures before going in…the downpour was underway when I was finished touring a few hours later. Touring Fernbank is self-guided, although the Museum does offer "hands-on, minds-on" field trips for K-12th grade classes. Be sure to pick up a Visitor Guide from the ticket agent or the ticket-taker at the beginning of your tour. Historically speaking, I enjoy starting at the top and working my way down. That's what I did on this particular tour. The Museum's exhibits and other offerings are located on three floors: the upper level, the entry level and the lower level. The Grand Hall, around which these exhibits and offerings are located, is a soaring three stories high…or one story high if the building had been built 245-65 million years ago and you happen to be an Argentinosaurus—the largest dinosaur to ever walk the Earth. The Upper Level should be called the Learning Level, I think. It's packed with opportunities to discover and acquire information about human life and geological development, just to start with. One of the current exhibits on the Upper Level is "Reflections of Culture." This smaller, densely-packed exhibit teaches how people around the world demonstrate economic, social and political information. The colorful display includes native costumes, jewelry and photographs—you'll surely want to examine each section. 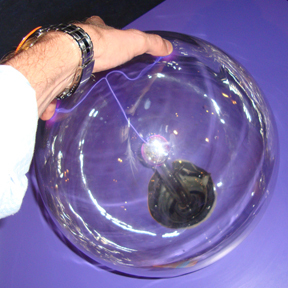 "Fun" is the best way to describe the "Sensing Nature" exhibit, also on the Upper Level. 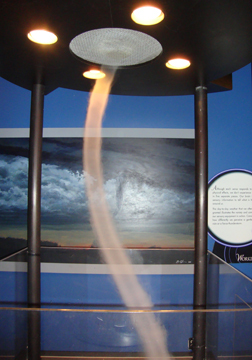 In this highly interactive exhibit, visitors learn about nature and science and have the opportunity to conduct their own television weather forecast. Be sure to look for the "coil" and truly test your senses. 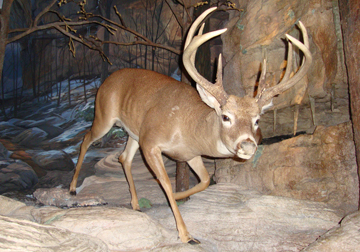 The "Naturalist Center and Curators' Corner" is an area specifically designated for family-friendly activities every weekend, including an "animal encounter!" The Museum is currently installing a new children's exhibit slated for debut in 2011. The mere mention of a multi-story tree fort makes me wish I was a kid again. On the entry level, be sure to explore "A Walk Through Time in Georgia." It takes you through the Okefenokee Swamp, an underwater habitat and you can literally walk around dinosaurs that lived in what would become Georgia. The exit to this gallery is subtle. Once you're through the coastal life section, there will be a sign on a door on the right that says: "this is the conclusion" of this exhibit, please exit here. "Conveyed in Clay: Stories from St. Catherines Island" is an insightful exhibit that shows the cultural evolution of Native Americans through their pottery. It's a modest exhibit and worthy of a visit. Also on the Entry Level are the Museum Store, which you’ll pass when you exit the Museum, and the entry to IMAX Theatre, which features various 45-minute films throughout the year. Fernbank is also home of "Martinis & IMAX" every Friday night (January through November). The evening features live music, an array of cuisine and specialty cocktails, all amidst the former rulers of the Earth. On the can't-miss Lower Level, Giants of the Mesozoic feature dinosaurs that lived in Patagonia millions of years ago, including a flock of 21 Pterodaustro flying high over your head. Be sure to look for fossils on the floor. Much of the Museum’s underfoot is covered in limestone that contains mollusk fossils from 180 million years ago. 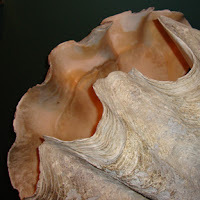 "The World of Shells" is a gallery featuring shells from Georgia and coastal areas around the world. The Giant Clam is the most impressive in size, but the exhibit is also wildly colorful and displays a collection of mind-puzzling shapes. 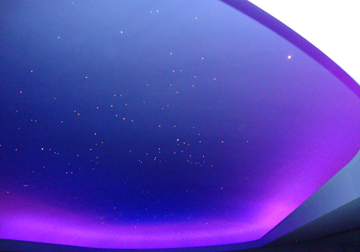 "The Star Gallery" is a special event venue at times, but during typical Museum hours, it’s an opportunity to learn about planetary evolution, celestial events and deep space activities—showing while I was there was the "Hubble Top 10" images. Feeling a little hungry after seeing so much? Stop by the Fernbank Café for a snack and a beverage. In the summer you can also sit on the patio overlooking the Fernbank Forest and make a photo of your fellow tourists with a pair of topiary dinosaurs. Will I return to Fernbank, you ask? Absolutely. The permanent exhibits are fascinating and there is always something new at Fernbank, whether a recently released IMAX movie, an exhibit debut or an enticing special event—and the parking is free! Monday-Saturday – 10 a.m. – 5 p.m.
Sunday – Noon – 5 p.m.